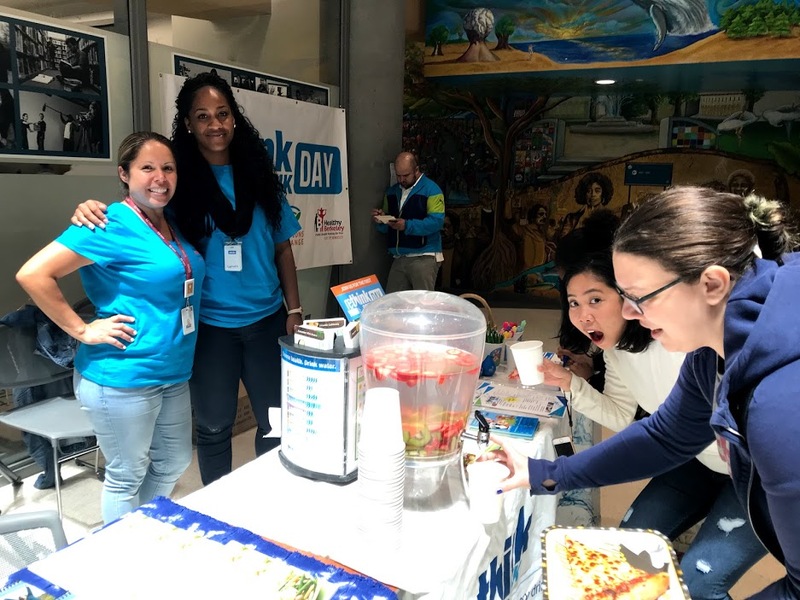 The Public Health Division’s Healthy Berkeley, Nutrition and Heart2Heart Programs are hosting Rethink Your Drink Week activities from Monday, May 14 through Friday, May 18th. Mayor, Jesse Arreguin, recognized the program team with a Proclamation on May 15th at City Council. We are collecting online RYD pledges and invite your support. City of Berkeley's Mayor, Jesse Arreguin, raised the importance and visibility of the Statewide Rethink Your Drink Day on May 16th to RYD Week in Berkeley from May 13 - 19th Proclamation. Mayor Arreguin presented the Healthy Berkeley and Nutrition Team (L-R: Dechen Tsering, Margarita Guerrero, and Kaprisha Dearman) with a RYD Proclamation in a ceremony at the City Hall on Tuesday, May 15th. Representatives from some of the community agencies that collaborated in the planning of the RYD Week joined the ceremony. Picture: City of Berkeley Mayor, Jesse Arreguin, with staff and community partners. On Monday, May 14th, Healthy Berkeley program manager, Dechen Tsering, offered information about type 2 diabetes and obesity and encouraged seniors to choose water over sugary beverages at the South Berkeley Senior Center. Our partners, Lifelong Medical Care's Heart-2-Heart Program offered free blood pressure check ups, Healthy Black Families' Water Ambassadors helped seniors fill out RYD surveys and collected pledge cards from willing visitors, and YMCA of the East Bay led sing-along-water-songs with the seniors. Picture: Water Ambassador, Monique Blodgett, explaining sugar content in sugary beverages. Senior community health specialist, Margarita Guerrero, and community health worker specialist, Kaprisha Dearman, brought Rethink Your Drink to the Berkeley City College (BCC) Grad Fest on Tuesday, May 15th in partnership with BCC's, Janine Greer and Mary Ann Go (aka Mango) and Healthy Black Families' Ajurra Smith and Water Ambassadors. Picture: L-R staff members in blue and Mango (in white) holding up her cup of infused water! The Healthy Berkeley, Nutrition and Heart2Heart program team hosted a well-attended RYD Health Fair at the Martin Luther King Jr. Park in Berkeley with community partners and other public health programs. The event was attended by community members, Berkeley High School students, SSBPPE Commissioners, and City staff members including the City Manager, Deputy Manager, and Department Directors. Physical activities at the RYD Day events with hulla hoops, soul line dance, and flashmob dance.